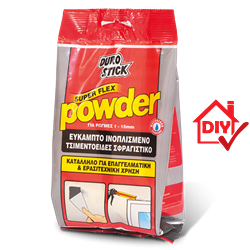 Innovative, vinyl based sealant in powder form. Reinforced with glass spheres, highly thixotropic and flexible. It presents zero shrinkage and strong adhesion to any porous or non porous surface. It is water repellent, it remains unaffected by frost or permanent moisture, even standing water. It seals joints or cracks on plaster, concrete and stone without peeling or shrinking. It also seals tile grout, marble and glass block joints, as well as cracks and joints on clay roof tiles, decorative bricks etc. Apply it using a putty knife or a small taping knife, and if necessary, apply it through the BLANK CARTRIDGE or the professional barrel gun, DUROSEAL 600 of DUROSTICK. Available in white, but it can be colored with the pigments in powder form, DUROCOLOR POWDER-C, when added in a 3%, by weight, ratio. Create 96 permanent colors or paint over it with emulsion and acrylic paints, 24 hours after its initial application. Certified as repair mortar in PCR R2 category, per EN 1504-3. Indicatively, 250gr fill 6 linear meters of a 5x5mm joint.